April 30, 2018--Finished! Again, this is "do it yourself" finishing and continues to be a learning process. Love the hearts designed by Gay Ann Rogers. The cording around the heart was made using my kumihimo disk. 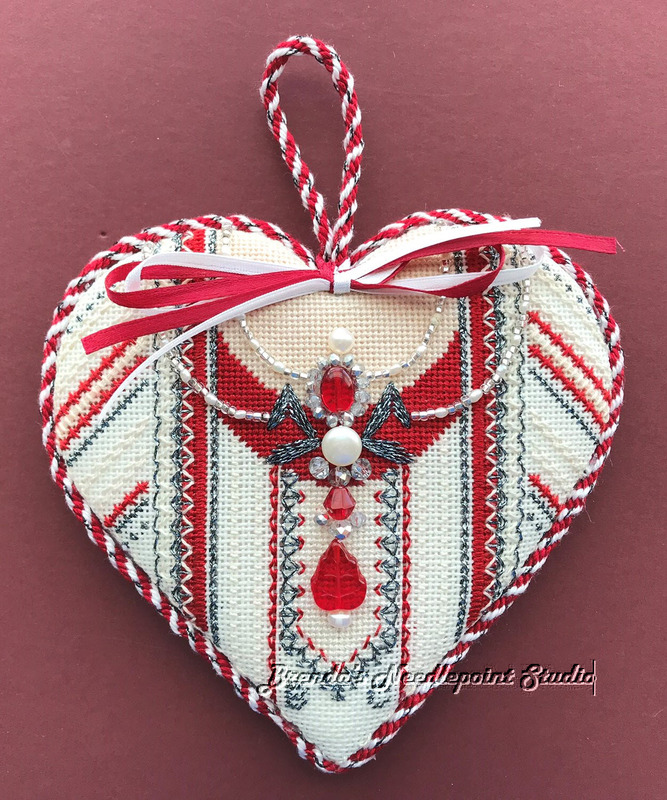 December 21, 2015-- Was so eager to complete this beautiful heart that I sat down and worked all the beading yesterday. The side views show the dimensions and beauty of the beadwork. Almost couldn't finish--discovered I didn't have a needle small enough to fit through the tiny pearl beads, and there were 22 of them on the two necklaces. Fortunately I remembered purchasing a new type of beading thread from Louise's Needlework shop in Ohio while there for a class last April. It's a very fine, strong braid and stiff enough to manually thread through the itty, bitty, teeny, tiny pearls. They are so small that I couldn't hold them with my fingers--had to use a pair of tweezers. Of course, I had to continuously thread up and unthread the needle to pick up the crystal beads. Took a bit longer than anticipated, but now that it's done, I'm very pleased. 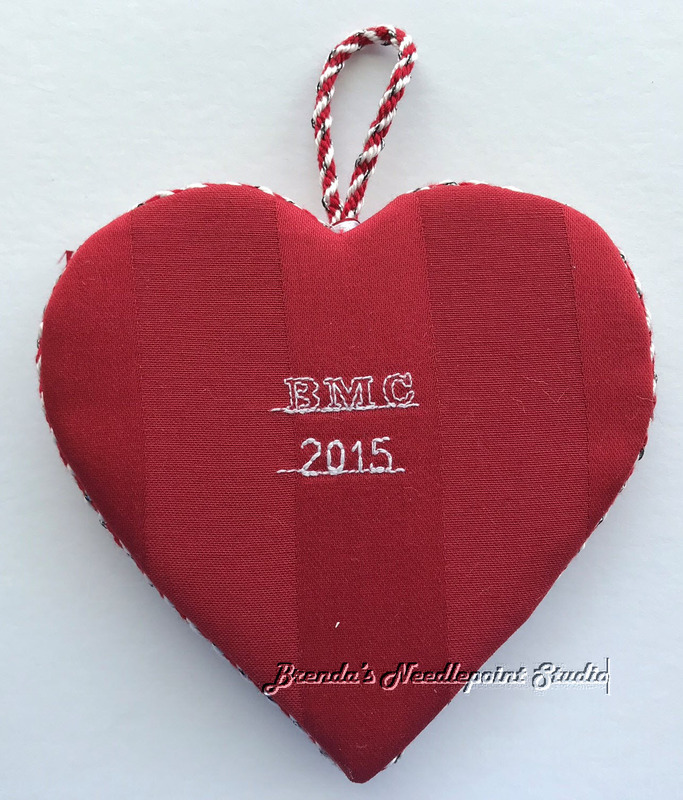 December 20, 2015--All the stitching has been done and ready for beading. November 24, 2015--This is my work so far on this lovely heart. Almost finished with the needlepointing. The beading will add the beautiful dimensions. See the In Process Tab above for a project photograph. October 17, 2015--For the very first time, I participated in Gay Ann Rogers' sale of her royal hearts and was able to purchase the Imperial Rubies Heart. Looking forward to getting the kit in the mail--these hearts are so beautiful.